In order to get rid of fruit flies, you must first learn how to identify them. Their most notable characteristic is their distinctive red eyes. These flies are about 30% smaller than house flies – they are about 1/8 inches long. When it comes to the colour of their body, they come in a wide range of colours starting from yellow all the way to tan colours. If you want to eliminate fruit flies without calling in the experts, you must have adequate sanitation. By doing this, you will cut their breeding sources. So, start by cleaning your bins and make sure that they have very tight lids. All fruits that are ripe must be placed in the fridge or consumed. Get proper drainage to avoid additional moisture. It is also a good idea to use screens on your home’s or building’s’ openings. Re-grouting tiles in the kitchen and bathroom can also solve this problem because by doing this you’ll reduce or completely stop water leakage. Finally, look for natural cleaners that can eliminate grease accumulation, this is especially useful in cases of commercial kitchens. Keep in mind that fruit flies are just one of the types of small flies that are often found in kitchens, but not all of them use the same breeding sources. 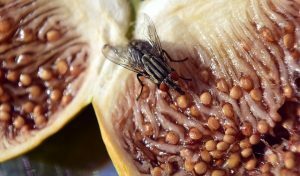 Fruit flies, as their name suggests, are found close to veggies and fruits – rotten or fresh. These flies can also be found flying around rubbish and organic matter. Many people say that specially designed fly traps for fruit flies have helped them. They have a special scent that lures fruit flies in and traps them. Of course, you can always prepare a DIY fruit fly trap. Those who have a serious problem with these flies can use insecticide aerosols. Since these products contain chemicals, you must be very careful if you are spraying in enclosed spaces. There are some environmental-friendly fly products available too. You can also use drain treatments because they often use these areas to reproduce. If everything else fails, you can call experts such as Pestbusters to help you. If you’re having problems with any type of fly infestation, please contact us now.